I reported a price reduction to the 38m motor yacht Indigo Star on November 4th 2011, and today brings news of a further €1 million cut from Jurgen Koch at Fraser Yachts. Indigo Star was built by Siar Moschini in 1995 to a design by Andrea Bacigalupo and this ABS classed superyacht was last refitted in 2008. 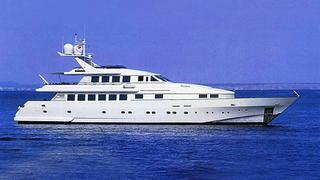 She can accommodate 10 guests in one master, one VIP, two double and one twin cabin. A range of 4,200 nautical miles at 10 knots is delivered by two 2285hp MTU diesel engines, which offer a top speed of 24 knots. Lying in Mallorca, the new asking price of Indigo Star is €2.95 million.